The Tongva/Gabrielino Indians inhabited a vast tract of some of the most fertile land in Southern Cal- ifornia as early as 500 A.D., yet they remain shadowy figures to us today. Their territory encompassed more than 2,500 square miles, covering familiar haunts in Malibu, Topanga and Temescal Canyons and extending farther east along the Los Angeles River. Without too much effort, we can encounter their legacy just by looking around at the native-plant habitat that tints the mountainsides and foothills of our region. 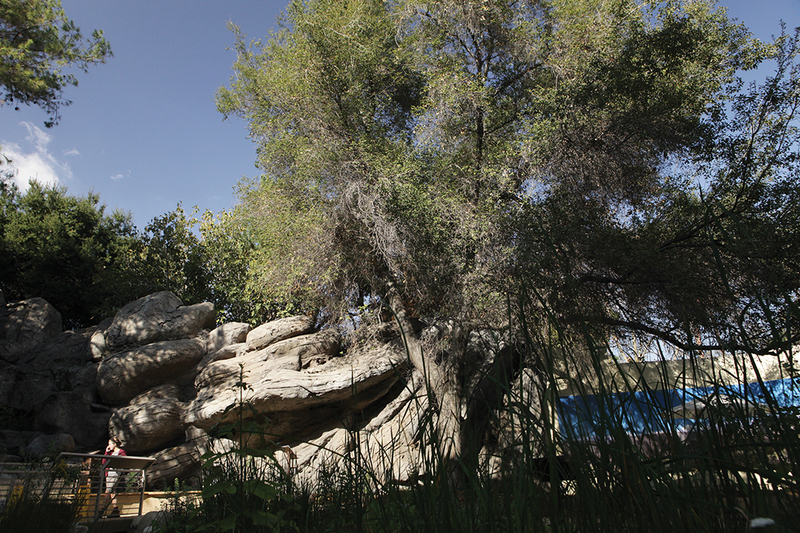 The Coastal Oak is the focal point of the Autry Native Garden. The acorn was the most important food source for the Tongva, superior to corn and wheat for its fat and fiber content. While modest in comparison to the exotic trees and plants we’ve come to love, the native California species prove to be best suited to our dry summers and wet winters. And, in a curious cycle, the wisdom the first Americans imparted is once again validated as we rediscover the practical culinary, medicinal and spiritual power of these native plants. The star of the coastal habitat, the most identifiable landmark, is the oak tree. The native garden on Temescal Canyon Road (just below Bowdoin) is anchored by three majestic coastal oaks, loaded with abundant acorns, which were one of the most important foods in the Tongva diet. 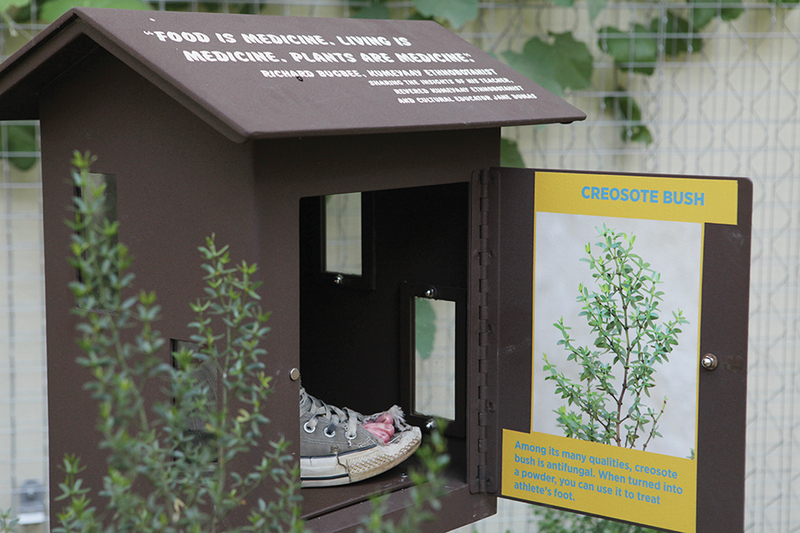 Interactive stations illustrate the value of Native plants as medical remedies. A demonstration native garden recently opened at the Autry Museum of the American West provides a succinct collection of native plants. It is also a compatible component to the redesigned galleries at the Autry that focus on the interdependent relationships between the indigenous people and the California environment. 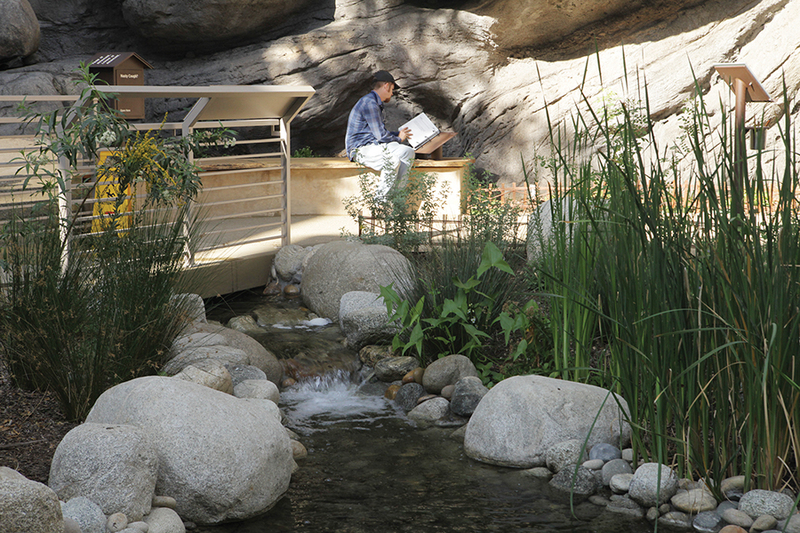 The garden, a modest 7,000 square feet, offers a microcosm of the range of habitats that were available to the Tongva. The Los Angeles River that was once a vital resource to the Tongva and for the plant and animal life, runs just behind the garden walls. From the inception of this exhibit over five years ago, the Autry was determined to get it right, to tell the story of our ancestors from the point of view of their descendants. “All of the work, all the voices really have come from native people, activists and educators,” says Erik Greenberg, director of education and visitor engagement. With 70 different species, one would expect to see accompanying descriptive signs by each plant, but not in this garden. “We’ve been careful; plants are the main focus,” explains Greenberg. All the descriptive information is contained in colorful notebooks located in each corner of the garden, illustrating the plant, its Tongva name and practical uses. The conditions and microclimate in the walled-in space adjacent to the San Fernando Valley limited the garden’s range from San Diego north to the Golden Gate. Rainforest plants of the northwest would not do well under these conditions. Designed by landscape architect Matthew Kennedy, the ethnobotanical garden spreads out around a pond fed by the cascading falls at the base of a granite outcrop. In selecting the plants, garden caretaker and Cahuilla/Apache Nicholas Hummingbird advised the museum on the proper species for each zone. As manager of the Hahamongna native plant nursery in Pasadena, Hummingbird knows indigenous plants and where to locate them. For example, when the garden was being installed, mesquite trees from Chile were indicated on the plant list. Hummingbird counseled against that species, confirming instead that the honey mesquite was the indigenous species for this area. The fresh water pond sustains a number of plants, including the Arrowhead (wapato), whose fleshy tubers were an important ancestral food; the Basket rush (juncus textilis), used for basket weaving, and the Narrow-Leaf Cattail, whose tough, flexible leaves were used in traditional house-thatching, clothing and baskets. “Four or five months ago, Nick called from Joshua Tree and told me he’d found honey mesquite,” Greenberg recalls, emphasizing that the plant community at the Autry is 100 percent native to the area. Early in the garden’s planning stages five years ago, Greenberg said they came up with the idea of having a medicine cabinet to demonstrate the medicinal properties of certain plants. They envisioned a box, which you could open up and see a bottle of aspirin and next to it willow, whose bark contains salicylic acid, the active ingredient in aspirin. Our interactive consultants began to question the name, ‘medicine cabinet,’ as being too commercial and not respectful to the native remedy,” Greenberg recalls. Instead, planners settled on three demonstration cabinets in the garden. On the door of each box, an ailment is presented along with an effective remedy. Coughs are relieved by Yerba Santa tea; athlete’s foot is soothed by preparing a talc powder from the leaves of the Creosote bush. To complete the display, the particular native shrub prescribed grows at the side of each demonstration box. In a playful game for children, you open the door and see a three-dimensional model of affliction: a congested lung cavity or a fungus-infected foot. 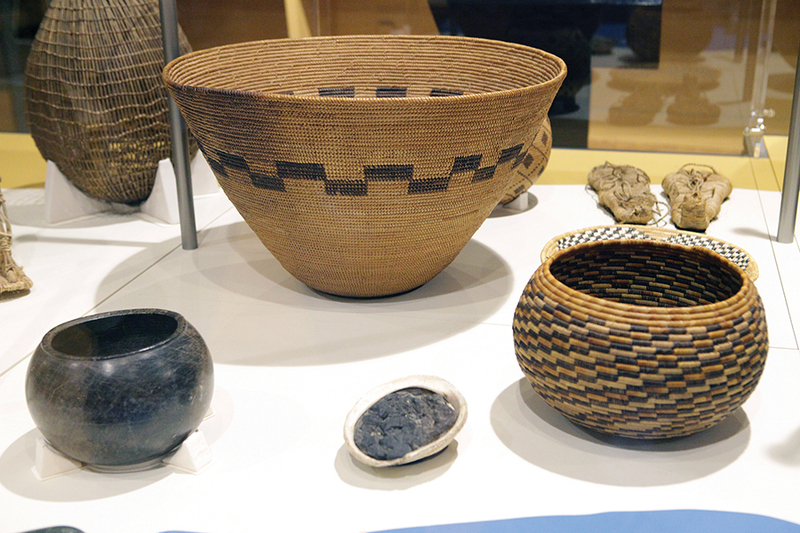 This exhibition display case features Tongva objects used for everyday activities. Lower foreground: Steatite (soapstone) bowl, 1500s-1800s, courtesy James W. Calkins Collection; Center foreground: Abalone container for asphalt (pre-concrete), courtesy, Burnham Chappelle American Collection. 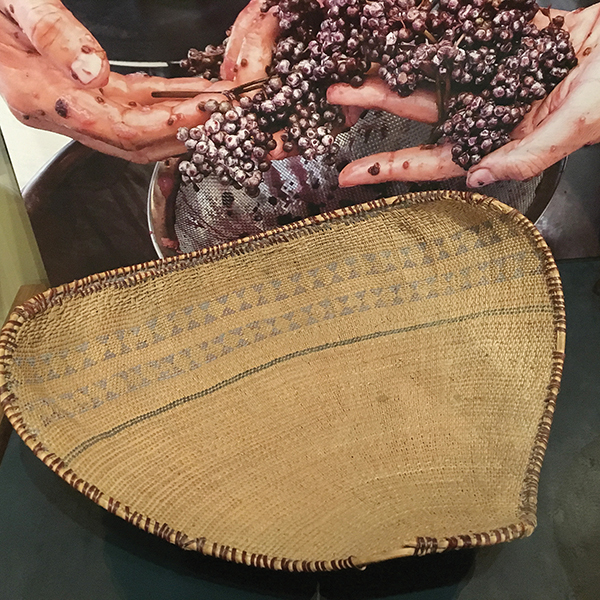 Foreground right: Tongva basket bowl, late 1800s, donated to the Southwest Museum of the American Indian by Miss Ethel R. Shorb. Center: Basket made from sumac, deer grass and juncus. The Autry space is remarkably tranquil. Seating areas located in various areas of the garden offer restful pause. The sound of the waterfall blocks out the freeway din, and the fragrances and seasonal color keep the senses refreshed. Inside the galleries, visitors can learn how these plants were used in Indian everyday activities. One display case identifies the plant materials, primarily sumac, deer grass and juncus, used to fabricate utilitarian baskets. Various baskets were shaped to serve specific functions. A scoop-shaped basket was designed to gather acorns and seeds; a winnowing tray to separate grains from chaff. The Autry Native Garden showcases what a large palette exists in the California Native catalog, the beautiful textures and fragrances. Visitors will see familiar plants, such as the native rose, grape and cherry, and make connections. At every point in the year, something is going to be flowering. The garden is the center of a vibrant living cosmos attracting local and migrating birds, insects, dragonflies and us human beings. The Autry’s collection of more than 500,000 pieces of art and artifacts includes the Southwest Museum of American Indian Collection. The museum is open Tuesday through Friday, 10 a.m. to 4 p.m. and weekends, 10 a.m. to 5 p.m. Contact TheAutry.org for more information.